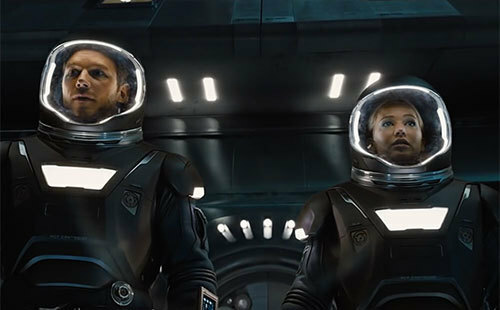 In Passengers, Earth sends a huge starship full of over 5,000 “sleeping” (hibernating in sleep pods) colonists to a newly-discovered world. 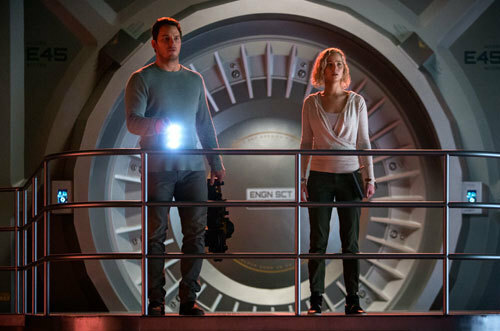 The trip is supposed to take 120 years but mechanical engineer Jim Preston (Chris Pratt) and journalist Aurora Lane (Jennifer Lawrence) wake up 90 years too early! Something is very wrong. Will falling in love help or hinder their survival? 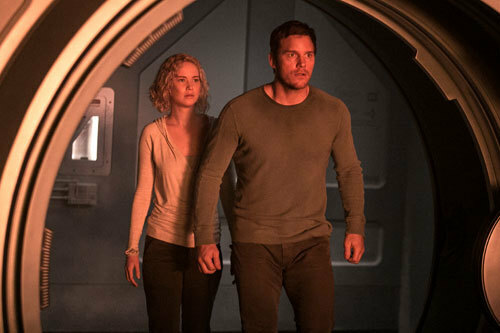 Both Jennifer (of Katniss Everdeen fame) and Chris (Guardians of the Galaxy and Jurassic World) are popular major movie stars who worked hard but had tons of fun making the Sci-Fi romantic adventure Passengers. They have a mutual admiration going that won’t quit. We learned that while Chris tried to stay healthy on set by pounding down a lot of Emergen-C, Jen introduced him to her fave “garbage” coffee creamer and now he’s hooked. Check out this fun exchange! Q: Jen, were you happy to work with Chris for the first time? And Chris, you with Jennifer? Jennifer: I had actually tried to work with him before. This wasn’t the first attempt I’d made because I’m a huge fan. I thought he was hilarious (on T.V.) in “Parks and Recreation” then when I saw him in Guardians of the Galaxy, he’s a movie star. 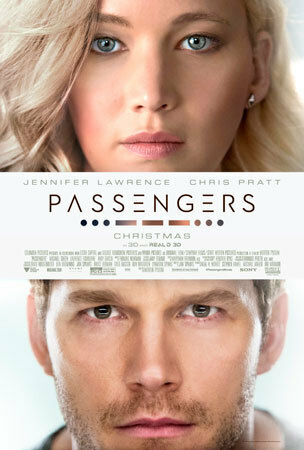 So, I was really excited and when it finally came together with Passengers, yeah, I was really excited (they both laugh). Chris: When I read the script originally, my manager said “I want you to picture Jennifer Lawrence in the lead role” and I was like “Yeah, right” but it ruined the movie for anyone else who would try (for the part) because when I read it I was like “Oh my God, this movie has to be Jennifer Lawrence” and “If you’re going to let me do this movie and she would be willing to do this movie, oh my, that would be the greatest thing in history” and she did it and I couldn’t believe it. I got to work with her and now she’s my best friend. Jennifer: (kidding) We’re mortal enemies. Q: What excited you about playing the role of Aurora? Jennifer: Performance-wise, I was really excited. There’s a lot of really powerful stuff that my character goes through and it’s also just an interesting emotional concept of realizing where you’re going to spend the rest of your life and there is nothing you can do about it. So, that was exciting to me. Q: And you Chris? What attracted you to do this movie (other than Jennifer being in it)? Chris: This kind of movie is nice because it has elements of action and drama and romance and suspense and, because of that, you get the opportunity to try different things as an actor. One day you are hanging from wires and the next day you’re doing an emotional scene or you’re doing a romantic scene. 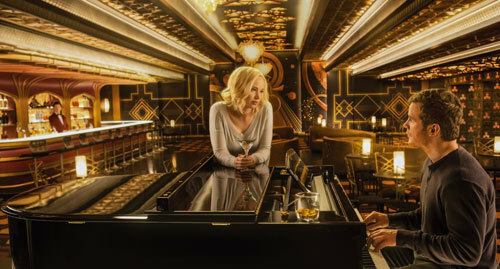 It was really an opportunity to play a lot of different notes and that’s really fun for an actor and I got to do it with…Jennifer Lee Lawrence. Jennifer: Seems like you forgot my name. Chris: I did for a minute. Q: Chris talk about the movie and your character Jim. Chris: In this movie you find these two characters who are seeking out a new life on a distant planet and the reason my character is on this journey is because he’s leaving behind a world that no longer needs men like him. He works with his hands, he’s building and fixing things. He’s a problem solver and he’s leaving a world when, if something breaks, you just replace it. He’s a pioneer and has longed for a time when his type of problem-solving abilities and his skillset can be useful so he wants to go somewhere where he can build a house out of nothing and I think he longs for a simpler time and he expects to find that on this new planet. Q: Cool. He has a sense of humor too. Chris: I wouldn’t say Jim is funny parse. He’s not necessarily a comedian by any means but, hopefully, there’s some humor in watching him in this situation. He’s not going to open a stand-up comedy club on Homestead II (new planet), but hopefully you will laugh a little bit when you see some of the situations he’s in. Q: And Jennifer what is Aurora like? Jennifer: Aurora is a writer. And, one of the things that I like about this movie is that it’s not post-apocalyptic. Earth is not in a dire state. That’s not why we’re travelling through space. Earth is fine. Aurora is an adventurer and she pushes herself so she wants to be the first person ever to fly to Homestead II, the colony planet, live there for a year then come back to Earth and write about it. She’s very ambitious and that can be quite a roadblock. Q: What are the themes or messages of the movie? Chris: We’re stuck together in isolation so there’s loneliness and solitude and all of the themes that float through this movie; deception, guilt, redemption as well as love and forgiveness and grace. They’re all very personal themes and that’s what’s really nice about Sci-Fi is that it asks questions that you can’t ask in regular story-telling but the answers often have to do with personal struggles and human emotions, desires and wants and what not. Q: It explores how two people would react in this weird situation? Jennifer: It’s such a dire situation and such an abnormal place to be in that everything is exaggerated so it is an interesting way to look at humanity and it’s a really interesting way to delve into a character. Q: Can you talk about the amazing sets? A lot of that was real, not all CGI. Jennifer: The sets were incredible. Every day we’d show up and there’d be something different. It was just so massive. Chris: Yeah, the starship Avalon itself is a massive, massive ship and we built sets in Atlanta and at Pinewood Studios. We actually had to tear a wall down between two sets to build the largest single set they’ve had there. The interior concourse of this starship Avalon is beautiful. A lot of times in movies like this there are elements of CGI but we had some amazing practical sets and Rodrigo, our D.P. (Director of Photography) and the electric crew and gaffers on this, they put in eight miles of L.E.D. lighting on it. Jennifer: I didn’t even know that. Wow! Chris: They never even took a day off because they worked so hard for four months straight without a day off laying lights. So much of what you see in the movie was there for us (actors) to interact with. (To Jennifer) I know you’ve done movies that have a lot of CG elements but the more you can create real elements around the actor, the better I think the performance becomes because you have something against which to react. Q: Can you talk about the action stunts in the film? Jennifer: (laughs). I’m definitely not the most athletic of the two of us. Chris: She can get a straw stuck in her nose. Jennifer: I can’t even drink a cup of water. Chris: Without nearly killing herself. Another inch further and she would have been lobotomized. But we had a great stunt crew and they were working hard and both of us had to do a lot of painful hours in harnesses and a lot of wire work. Q: What was your favorite thing at the craft services table? Jennifer: You love that Emergen-C.
Chris: Yeah. I’m down with Emergen-C.
Jennifer: Then you got into my (fave) which is coffee with that garbage creamer. Chris: Oooooh, love garbage creamer coffee. Love that. I’m a real cowboy. I drink my coffee black but she put in some straight up junk made out of melted milk cartons or something or DuPont paint thinner but fudge is it good! Jennifer: It’s straight from Walmart and it’s my favorite. I love it. Chris: She’s Dior on the outside, Cracker Barrel on the inside. (She laughs). Jennifer: That’s a huge compliment. I’m really flattered. I can’t wait for my parents to read this. They’ll be so proud. Q: What do each of you bring to the set that the other appreciates? Jennifer: He brings a good energy and a good mood. He’s a spirit-lifter for everyone. He’s the hardest-working person on set and this includes the entire crew. And we had a very hard-working crew. Jennifer: You’re like the Energizer Bunny. Chris: Jen makes me laugh almost like no one else in my life. She cracks me up so hard all day every day. She’s really funny. Jennifer: Mostly it’s just the things that I’m accidentally doing. Chris: No, I’m totally laughing with you, not at you. She’s very funny and extraordinarily tough and I love that. 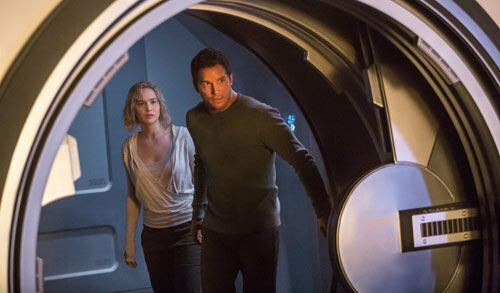 See Passengers in theaters next Wednesday December 21st! Are you a fan of both Jennifer and Chris? Are you into big Sci-Fi movies as well? Talk about it with a comment below! Would You Like to Travel to Outer Space? Yes, that would be totally wicked. No way! I'm staying right here on earth. Maybe if I could pass all the tests. I would love to go to space... but math's not my strongest subject.